In 2017, YSL Beauté taps into the playful characteristics of modern day make-up lovers with a pioneering hybrid formulation. Two formulas; double the benefits. With new VOLUPTÉ TINT-IN-BALM, sheer glowing colour conspires with melt-on-the-mouth nourishing care, leaving a kiss of tint as the clue. So skip the mirror; leave effort behind. 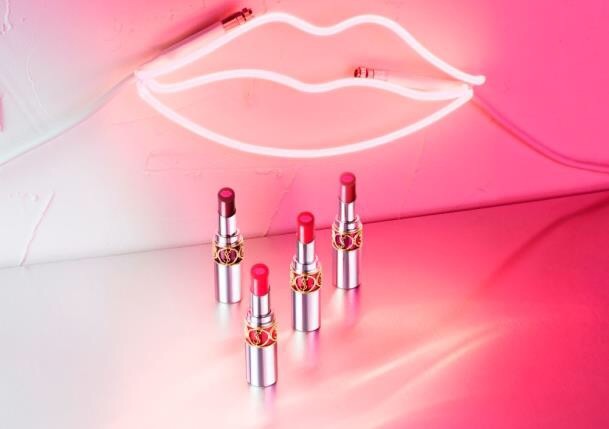 VOLUPTÉ TINT-IN-BALM is the addictive no-brainer for instant colour glow and lasting lip care. Fusing the nourishing care of a balm with instantly radiant colour, new VOLUPTÉ TINT-IN-BALM is a match made in make-up heaven. Thanks to a unique double core, it comes with twice the benefits – then delivers a completely unique lip finish. Instantly the outer shell delivers glowing sheer colour with a vivid yet transparent colour pay-off. At the lip-shaped heart of the bullet, a continuous core comes courtesy of new, double “back injection” technology. Two formulas with two different textures are back injected into the bullet to deliver a dual performance formula with a ground-breaking YSL Beauté finish. Easy, breezy – quick as a flash. VOLUPTÉ TINT-IN-BALM leaves a kiss of tint with a just-bitten glow. Addictive, compulsive, a definite cause for obsession – the more you apply and reapply, the more the lasting tint effect intensifies on your lips. Day after day, the nourishing formula promises melting balm care with each swipe. Available in three shade families, the unique 2-in-1 formula even comes imprinted with a playful lip kiss print at its core. Available exclusively from Brown Thomas Dublin, Limerick, Cork and Galway and online at BrownThomas.com and from March and launching nationwide April 1st 2017.